There are altogather 9 beaches on Ko Lanta.Starting from the northest to southest at the National Park. 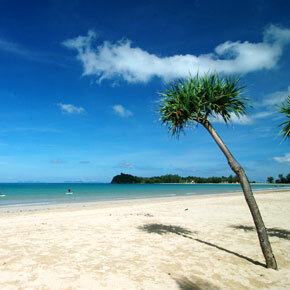 The first is Klong Dao Beach, the most popular beach and closet to the Pier. Klong Dao Beach is a spectacular three-kilometers stretc of white powder sand was the first beach to be develop on the island just only five years ago. With its spectacular sunsets and white-sand landscape we can see why. Excellent, safe swimming makes this the most popular family beach, but even in peark season this huge beach never gets crowded, and a short walk will find you a patch without neighbors. The beach offers a wide selection of up-market resorts, many with swimming pool, aircondition, and hot shower. Lanta Bee Garden is the last of small family owned resorts on this beach with something for all budgets. Klong Dao Beach - The most popular beach of Ko Lanta.